Yesterday's Dawn had a letter urging a focus on science & technology. I was already thinking about this while watching the plethora of cable and satellite channels here in Pakistan (a list from Wikipedia). There are countless news talk show programs on more than 10 24-hour news channels. In fact, while arriving in Karachi yesterday, we were stuck at the airport traffic because there were about 8 television vans taking up space in the exit lane (they were there to cover the arrival of a federal minister). There are 8 24-hour music channels. I haven't seen these yet, but there are 3 fashion and lifestyle stations. There are 6 24-hour religious channels, and perhaps not too surprisingly, there are three food channels! Oh - and then there are about 10 regular channels that run soaps. But science is missing. I'm not referring to a 24-hour science channel - which would be very cool. But even just an hour-long local program on science would be beneficual. There are are primetime programs on astrology (for example, here on Geo). But no science. There is indeed interest and curiosity about science. As I have written multiple times before, the amateur astronomy scene is booming here. Whenever I have given talks here, I have encountered a lively audience interaction and a genuine interest in the topic. I'm sure if there were regular science programs on TV, there will be an audience for it, and if done well, the programs can serve as a vehicle for critical thinking. By the way, just having science-sounding programs is not enough. Perhaps, there is no bigger disgrace than the Discovery channel or the History channel in the US. They lend credibility to completely wacky programs - from UFOs to the end-of-times documentaries. Whenever a student start by saying "I saw it on the Discovery channel" and you go "uh-oh". This is such a shame. Just think about it. In Pakistan, I'm lamenting the lack of any science programs. In US, there are couple of 24-hour science channels - but they mostly show crap on it, or worse, bad science (In case you are wondering, yes, bad science is worse than crap). NOVA is perhaps one of the few science havens left. Some of it is also personal. I got into astronomy after watching Cosmos on TV in Pakistan in 1984. The first episode - especially the Cosmic Calendar - was enough to change the direction of my life. Television is an amazingly powerful medium. You never know how science programs are going to affect people. Lets have some (good) science shows on TV. By the way there have been some efforts at producing science programs in Pakistan. For example, Pervez Hoodbhoy had an excellent 12 part series for kids about 7-8 years ago. 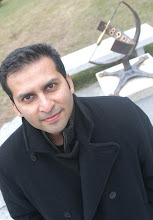 And more recently, Zakir Thaver has also produced some science-related episodes. These need to be aired on channels such as Geo, ARY, PTV etc. So true Dr. Salman...so very true. Dozens of channels and hundreds of transmission hours daily of nothing but rubbish, and not a single hour dedicated to science. What a shame indeed. I remember when I was a primary school boy in late 80s (during General Zia's dictatorship of course) there was only one channel in Pakistan, that was PTV. Its transmission time was only from 4:00PM till around 12 midnight. Yet still, there used to be one hour dedicated for science program daily at the prime time, usually anywhere between 5pm to 7pm, both locally made programs and purchased from abroad, usually dubbed neatly in Urdu, like Cosmos and National Geographic. There was an astronomy program (one series about universe and second series about Mars). It had a Pakistani host (a middle aged gentleman in glasses and moustache, I don't remember the name) was literally marked the beginning of my astronomy passion. And of course we can't get away without paying tribute to Dr. Hoodbhoy for his series too. There used to be a program about human body with a Pakistani doctor as host. Allama Iqbal Open University had made many scientific programs too. These are just a few of many. Gone are those days for ever. Quantity has beaten the quality in Pakistan like never before. Your observation is crucial. Media in Pakistan today holds immense power and can literally sway public opinion on a lot of matters. If only some investment was made in Science and technology oriented productions, it could go a long way to promote the discipline and stimulate public interest. Moreover, it can also effectively overcome the Urdu-English divide that is sometimes considered an obstacle to the popularizing of Science amongst the masses. I came across this intresting video. I posted two comments on the record breaking post yesterday. They have still not appeared. Hope you do not mind checking whats wrong there. What happened to the comment I previously made here? I thought the youtube link I gave is an interesting link and would like to know what it is all about. Is NASA really hiding something? So i will post that link again. Hope this time it will be there. Uh-oh. Ali. I'm not at liberty to comment on this alien spacecraft. Oh - I mean there is no spacecraft. What spacecraft? Ali you have now found the Truth. Something that NASA had been hiding since the Roswell Crash in 1947. Oh no. Now this will start a whole chain reaction of events. The butterfly effect - the chaos theory. NASA had been trying to save us from the aliens - but now you have exposed their lies. Now the world will end. Please note: The frequency of posts on this blog will drop to once a week after the end of the world - whenever that happens to be the case. The symmetry of the figure in the image clearly shows that it is a reflection inside the lens or the filter of the device. If it is a 'spacecraft', why is it facing the telescope at exactly perpendicular angle and facing the sun exactly radially? That would be far less likely in a snapshot. We see a lot of these reflections while viewing the Sun through solar devices. Secondly, the brightness of the sun is reduced millions of times through filters, so anything showing up in the view would be as bright as the Sun. The 'spaceship' was perhaps glowing brighter than the filament of a light bulb! When will people stop believing such things?